Art provides a sensory experience that can restore our spirit, soothe our soul and tame the inner beast. I am equally right and left brain balanced. I could not do it ( left brain ). Now many years down the road I have come to terms with the fact that I love dozens of techniques and ideas but have come to grips with the fact that I cannot institutionalize them into my art work. Abstract art being one of the hardest things for me to master but by using the Gel Press® plates I can create abstract art..
it frees my left brain! And this makes me feel wonderful! 2. 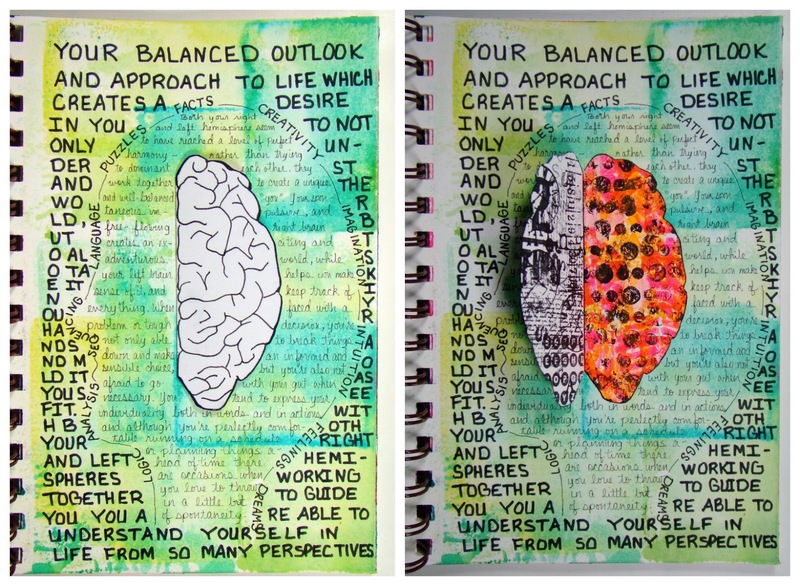 Used my Gel Press® plate to create the colorful right side to symbolize creativity, feelings, dreams etc. 3. Using stamps with letters and numbers for the left side of the brain to signify logic, puzzles facts etc. This is your brain. This is your brain on Gel Press®. A good old fashioned distraction from things like...oh...let's say politics! I am so over the anger, the bashing and name calling...and no that's not the politicians I am talking about, that's my "Facebook friends" I am referring to. I have unfollowed so many of them lately because of their political bullying. I needed to do something light hearted and silly and with Halloween around the corner I decided to play with my Beatrice Coron - Danse Macabre stencil from Artistcellar. I wish I could tell you I layered everything in the correct order, but nooooo, you know me...let's do everything backwards! lol I did have a paint brayered background to begin with and then I used the stencil, which I used 2 different ways. I outlined it for the "man" and painted the back of the stencil in black paint and pressed it down for the the 2 dancing "goblins". Next I tore apart bits of a Gel Press print to create the floor...and yes, I had to cover up parts of what I had done previously because ...well, because I seem to just do things in that kind of order, so after I glued down the "floor" I had to back over with the stencil and redo the bottom part of the legs. Then, I stenciled the brick background...not so easy stenciling around the skeletons so at least give me points for perseverance! At least I waited and added the Netflix head from their mailing envelope after the background was made...whew, right? And the last things I did was to stamp and write the journaling along with stenciling some magical bubbles...and doodling a little bit with my white Signo pen...still by far, my favorite white pen! Have you ever had? then lost it? then regained it? in your art? The "art" to this process is sometimes walking away ( sometimes for a LONG time, like weeks ) but, and this is the hard part...never giving up! Then I thought I would take this piece of text paper and do a collage around the outside edge of the cover and this is where I go off in the little art abyss where I know I am in trouble but I cannot stop myself. ( kinda like wiggling your legs in quicksand, you know your making it worse, but you just do it anyway! ) I began covering up all the stuff that I really liked....wth? ( insert big sigh here ) and this is where I should have walked away...should have, should have...oh why didn't I? But noooooo...well, I messed up big, BIG time. I used way too much alcohol ink and it just made a super big YUCK over everything! I frantically spritzed the cover with alcohol and tried to wipe everything off as best that I could considering the frame of mind I was in by now, and then I very calmly walked away from it. Cleaned up my work space and admitted that I was defeated...for now. I was sitting on the couch opening my mail and sorting it into piles...what to keep, what to pay, and lastly my favorite, what to re-cycle into handmade paper when I came across some "fan art" that Netflix ran a contest for ( and which I sadly didn't enter ) big regret now, but oh well...I immediately cut the image out and laid her on top of the journal cover and it just fit...and I knew I wanted to use it along with the words above...very simpatico! Sometimes the journey in art is a straight path, and sometimes it is the long, winding backroad that you get lost on...and when it's all over it doesn't seem so painful and ridden with angst...it seems to be just something you had to go through to get where you are. Some days I just can't think of anything that I want to paint...or draw....or anything. I just don't feel inspired, but I feel like I should do something. At least if I was motivated to go work in the garden, walk around the park or even ( heaven forbid ) clean house, then at least I would be doing something! I did spend a few minutes this morning requesting that my library invest in some more art books...it's the least they could do to rouse my muse, who seems to have disappeared on me...yet again. So I wandered back into the art studio and pulled out my Gel Plate® and just played, with absolutely no goal in mind. That's usually the best time to do abstract art...maybe it will be a background for another piece or perhaps it should be left alone? What do you do when your muse abandons you? I use to scrapbook...a lot. 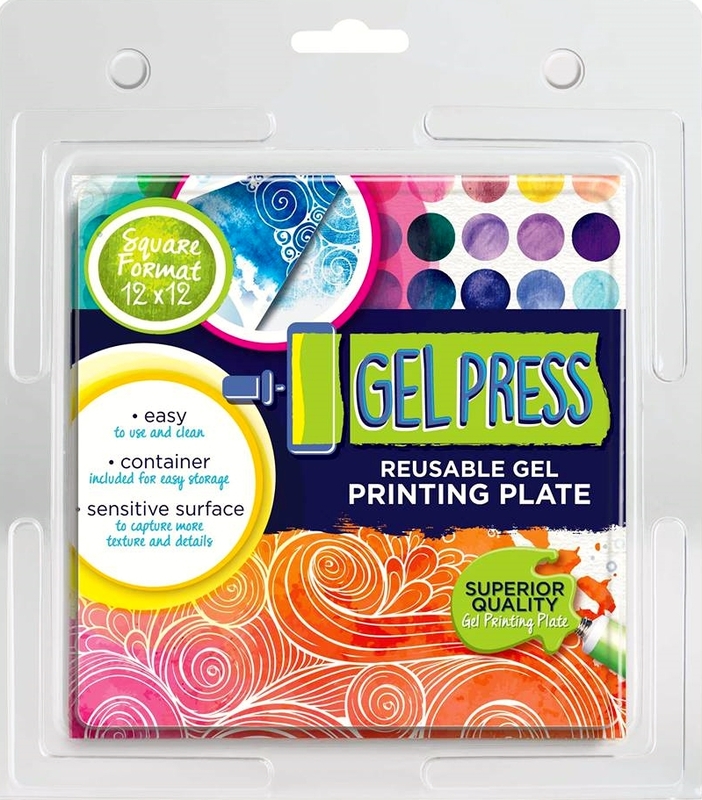 And now I have no excuses not to do it again because Gel Press® has come out with a 12x12" plate for scrapbookers! 2. to art! 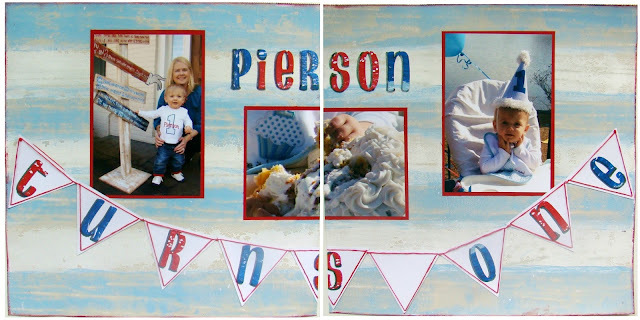 I love making my OWN background papers and all my letter coordinate too which is a bonus, no need to buy everything trying to get it to all match! I've practiced Blind Drawing throughout my life, even as a child I would draw animals and flowers with my eyes closed, not trying to be blind but seeing if I could remember where I was spatially on the paper without looking. I used to put notebooks on top of my head and draw....I know, I was a weird child. It's been utilized as an adult when trying to record dreams while still in the dream state under the covers of my warm bed by blindly writing down my recollections while I can still remember them. So when I saw Carolyn Dube put out the challenge for Blind Painting, I thought I'd give it a go, but I did opt out of using paint and chose gelatos instead which made it a little less messy. 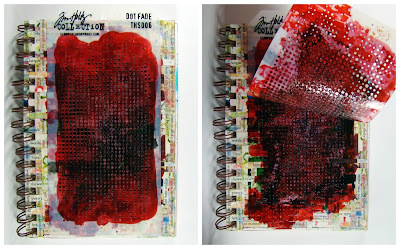 I also chose only 2 stencils and 2 colors of gelatos and began on a brayered background of acrylic paint in my journal. I also had to let the gelatos dry so I got to open my eyes and see what it looked like and was very pleased. After it was dry I came back with my gel pens, closed my eyes again and drew a very wonky flower. Looks like something a toddler would draw and I just went with it and colored in the blocked areas with different colors. Then as I sat looking at my little tiny flower the words "Don't take anything for granted in life" just came to me so I stamped them along the side. The last eclipse of the year is a Lunar Eclipse on Sept. 16th, in the sign of Pisces. This eclipse is suppose to have a very powerful and high vibration with Pisces's energy being highly creative and intuitive. Being that I am born under the sign of Pisces and being...well...arty....I paid close attention to the signs in the hopes of being more...more creative...more everything! 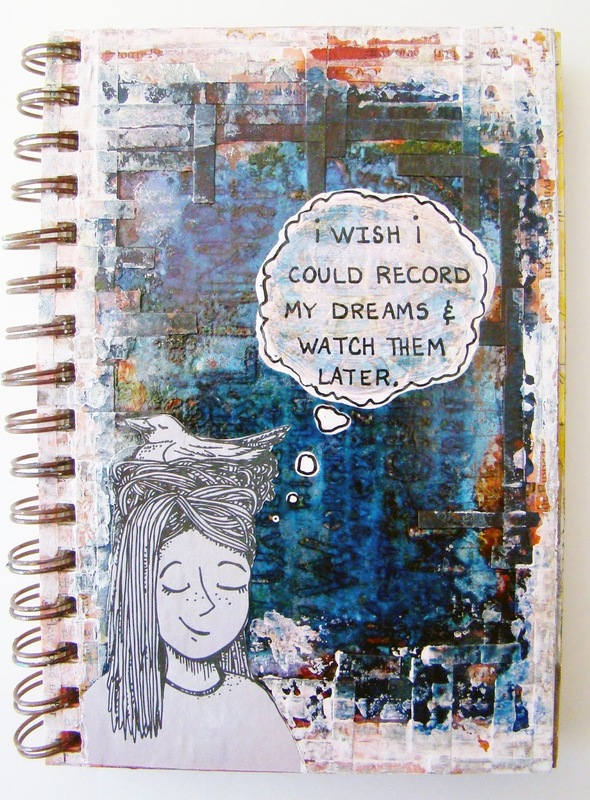 I went outside and looked at the moon and then came back in and created this art journal page. since I used 2 movie ticket stubs to submit what I would like to get out of this moon phase....peace, art and love. I'ts suppose to be full again tonight so I'll go out and do a little mantra meditation tonight. I know you can't see the Mother Moon very well, she is actually a "promotion" sticker I got several years ago at a tourist shop and I just cut her out but since she is gold foil she is hard to capture on the camera. What are you hoping will happen to you? Everyone that knows me knows that I just love the technique by Mary Beth Shaw of Stencil Girl of dropping Tim Holtz® Alcohol Inks through a Seth Apter stencil. Well, I just discovered last night, thanks to Sally Lynn McDonald that I can do this same technique on my Gel Press® plate by just using a little hand sanitizer! whoa!! Needless to say, I ran to the store to get some as fast as my little Jeep would legally allow me to do so! I made a video to show you how I did it and how I made this ghost print too! And did you know that we just added a new plate size? The 12x12" plate is perfect for scrapbooking!! 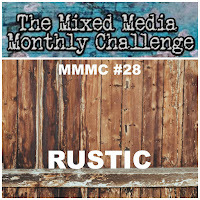 Mixed Media Monthly Challenge #28 "Rustic"
I'll admit that what I ended up with is completely opposite to what I had started out with which I covered with a layer of white paint to which I loved the next morning! lol Funny how that happens, but sometimes giving in to defeat and starting over can be the best thing. Other than the white paint everything else if Faber Castell, the gelatos and the PITT pens. I love how smoothly they blend over the acrylic paint. I hope it looks rustic enough, it's a style I don't do often, at least not intentionally which made for a good learning experience. I also got a chance to add some practice to my typography with Marie Browning, she makes it looks so darn simple. I tried using my Tombow over the acrylic paint but it didn't show up black enough so I had to go over it again with my Micron Graphic....BOTH which rub off of acrylic paint pretty well with some spit...just saying, did I mention I need practice? I love stamping to pieces! I love this Grumplings stamped image, I think her expression looks like mine when placed in a bathing suit, although she is too cute to be so grumpy! Everything but the base card is made from my stash of handmade paper that I made using my Arnold Grummer hand mold, I love the texture and feel of it. I admit, I do! 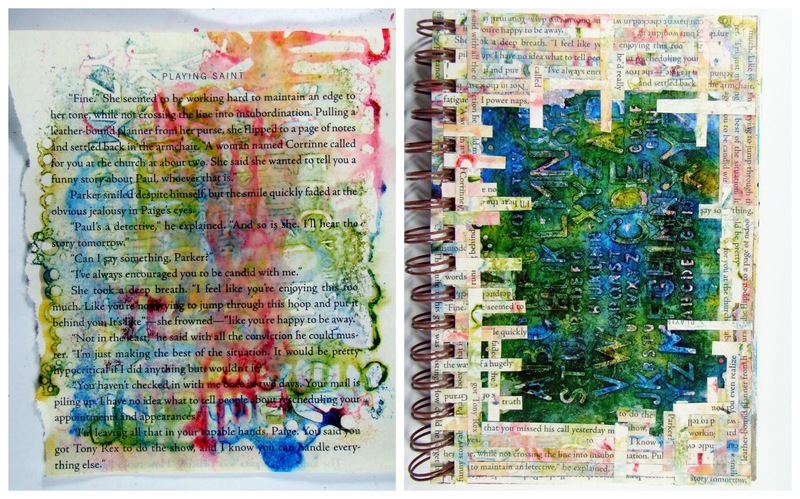 I am so addicted to using my smaller Gel Press® plates as stamps when I am working in my art journal. It just makes it so easy...and I am all about easy! My post is up over on the Gel Press® blog today and I would be honored if you stopped by and left me some love over there. I admit I don't watch too many other artists very closely, and don't get me wrong, it's not that I think I am too good or better than them, cause I'm not. BUT I can pick up someone's style way too easy and copy what they do and that's something I try to avoid. I think the hardest thing for me is developing my own style, but every once in a while I watch somebody and get a sense of of...wow...why didn't I think of doing that? I've done a few life drawing classes ( they have been put on hold right now because this is our busy season...aka tourists so the studio that usually holds the classes has been busy...bummer for me, great for them ) Anyway, back to the point I was going to make...I watched Jane Davenport today over on Find Out Fridays by Donna Downey and loved her life drawings, but what really got me was that she took them to an art journal type of spread...so...I went and got one from my earliest class that I did not like and played with it. This is what it looked like...(and funny thing is, I think I am the least wild, the least imaginative artist out there but in the live drawing class I am ( so far ) the only one who sketches in color!) But..this was not a good sketch so if I ruined it I would not be upset. After watching the video by Jane, this is now what she looks like. I haven't decided if I want to add any words or not, right now I am content with the way she is...what would you do? Yes, I have been ploitering a lot lately. Doing things that are not on my to do list. I do love Marie's typography videos over on Tombow lately so I found this one to be copesetic to my life right now. ssssshhhhh...Daisy Mae is hiding while I ploiter. I did do some art work during my ploitering....just wasn't what I needed to be doing. I played in my art journal...no, that wasn't on my "art do" list. And yes, I have art lists. And still not on my "art do" list although a tad more productive since I can make prints of this to sell was dropping alcohol inks through a stencil....a technique I have found to be most satisfying when I don't feel like doing much of anything. For me this has been a blah week...not very productive at all.